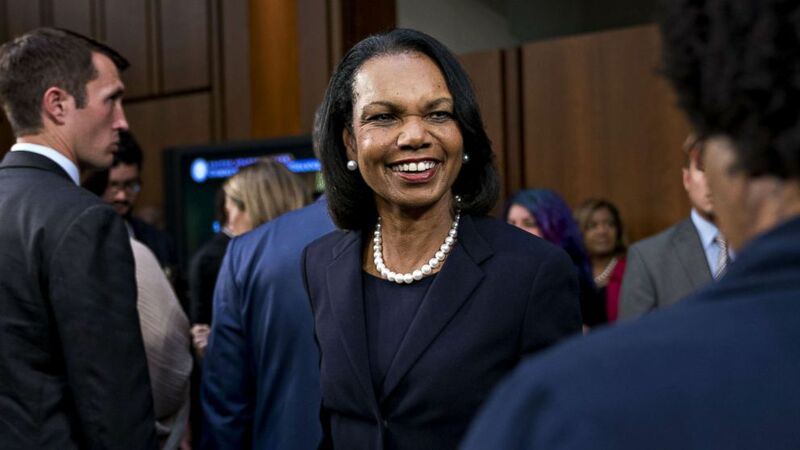 Former Secretary of State Condoleezza Rice has emerged as a possible NFL coach. She was the first woman named White House National Security Advisor and quarterbacked former President George W. Bush's foreign policy team as Secretary of State, and now Condoleeza Rice's name has surfaced as a possible contender for an NFL head coaching job. When Cleveland Brown's General Manager John Dorsey said last week that he would consider a woman to lead his perennial losing franchise, Rice's name was quickly thrown into the mix even though her only NFL experience is being a Browns' fan. ESPN cited an NFL source saying the Browns would like to interview Rice for its head coach position, which would make her the first woman ever to be considered for an NFL head-coaching job. "She's an amazing person," an anonymous source told ESPN of Rice, who has been a former member of the College Football Playoff selection committee. (Ezra Shaw/Getty Images) Honorary Stanford captain Condoleezza Rice walks to the middle of the field for the coin toss with the Stanford Cardinals before their game against the Notre Dame Fighting Irish at Stanford Stadium, Nov. 28, 2009 in Palo Alto, Calif. But shortly after the ESPN story was posted online, Dorsey released a statement calling Rice a "great leader" who "possesses the highest possible character." Still, he said her name is not on the short or long list to replace Hue Jackson, who was fired as the team's head coach on Oct. 20 after winning just three games in more than two seasons. "I have the utmost respect and admiration for all she's accomplished and was honored to meet her for the first time earlier this season," Dorsey said in his statement. "Our coaching search will be thorough and deliberate, but we are still in the process of composing the list of candidates and Secretary Rice has not been discussed." Rice, 64, issued a statement on Facebook on Sunday, saying, "One doesn't have to play the game to understand it and motivate players." "I love the Browns -- and I know they will hire an experienced coach to take us to the next level," Rice said of the franchise that has not made the playoffs since 2002 and finished last season with an 0-16 record. "On a more serious note, I do hope that the NFL will start to bring women into the coaching profession as position coaches and eventually coordinators and head coaches," Rice said. "But experience counts -- and it is time to develop a pool of experienced women coaches." (Andrew Harrer/Bloomberg via Getty Images) Condoleezza Rice arrives to introduce Brett Kavanaugh, Supreme Court associate justice nominee, Sept. 4, 2018. But she added, "I'm not ready to coach but I would like to call a play or two next season if the Browns need ideas! And at no time will I call for a 'prevent defense.'" Rice's quip was apparently in reference to former Brown's coach Marty Schottenheimer's decision in the 1986 AFC Championship game to play "prevent defense" only to see Denver Bronco's quarterback John Elway lead his team to a 98-yard game-tying touchdown in what became known as "The Drive." The Broncos went on to win the game 23-20 in overtime, spoiling Cleveland's dream of making it to the Super Bowl. Rice is currently a professor of global business and economics at the Stanford University Graduate School of Business. She is also a senior fellow on public policy at the Stanford's Hoover Institution. During a press conference last week, Dorsey initially said, "I know me personally, I would like to see a man of character. I would like to see a man who can lead young men. I would like to see a man who has high football acumen. Those are the three basic things there that I would look for." But then he changed his tune when asked if age is a significant factor for the next head coach. "I just want the best possible head coach to move this thing forward regardless of age," Dorsey said. "It could be a woman, too. Do not look at me like that. I am serious. Who knows? We will look at everything is what I am trying to tell you all."